As part of its mandate to protect and serve the public interest, the College ensures only qualified veterinarians are licensed to practise in Ontario. To obtain a licence to practise veterinary medicine, applicants must meet the College’s requirements. 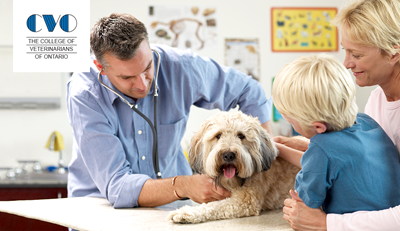 There are approximately 4,500 veterinarians licensed in Ontario. This section is designed to help recent graduates, veterinarians working elsewhere and internationally educated veterinarians to understand the College and its licensing process. The College ensures only qualified veterinarians are licensed to practise in Ontario. This section will help all applicants understand the College's licensing process. The College provides information on its fees related to application and licensure. Also included for reference are the National Board Examination fees.. The CVO Jurisprudence Examination requires candidates to demonstrate knowledge of the legislation that governs the veterinary profession in Ontario. This legislation contains Practice Standards, rules about conduct, and expectations for ethical practice. The Registrar may refer an application to the Registration Committee when it does not meet all requirements. Applicants not satisfied with the decision may appeal to the Health Professions Appeal and Review Board. Refer to this listing of upcoming events, including Council meetings, workshops and webinars and general meetings.